10/52 Les Winan Hilarious and absurd, the film has some dead spots but features outstanding work by all the actors. Is NASCAR Nation in on the joke? 23/65 Kim Hollis I laughed and smiled so much my face hurt at the end. 24/47 Amanda Jones Not completely unfunny, but I spent a lot of time waiting for it to be over. 29/159 David Mumpower Will Ferrell's brand of comedy, the non-screaming stuff, is impossible to quantify but I find it hysterical. Anchorman fans should eat this up. 118/200 Max Braden For fans of Ferrell, while I think others will be bored. You know who’s funny? Will Ferrell. Especially when he’s yelling. And given the fact that the cockpit of a race car is probably one of the noisiest places in the world, he’ll have plenty of opportunity for just that as he stars as a NASCAR driver in Talladega Nights. 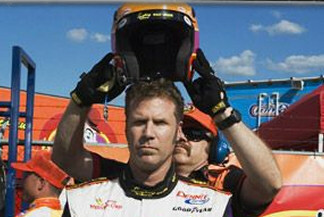 See the latest developments for this project on the Talladega Nights: The Ballad of Ricky Bobby Movie News page.